Here I share some glaze recipes tested with materials commonly available in Taiwan. They’re all frit-less, as it is hard to buy here. NB: UNDER THE HEADING “GLAZE TESTS AND RECIPES”YOU WILL FIND SEPARATE ENTRIES FOR OILSPOT, JUN AND GUAN ICE CRACKLE. This is a very stable glaze, always comes out looking nice. 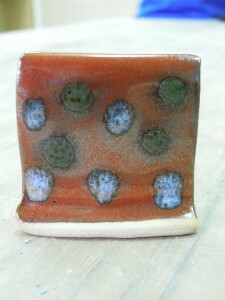 If mixed 2:1 with a celadon-type glaze, nice variations of teadust glazes result. 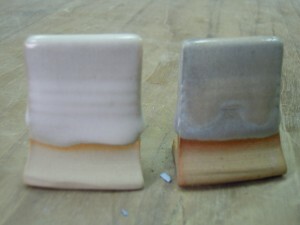 On the right, these are both Reconstructed Nuka, fired in oxidation (left) and reduction (right) respectively. The reduction test has more interest, but I am very happy to have found this melted-icrecream-look of the oxidation sample. These tests were done on white clay. 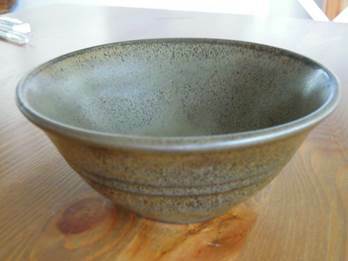 Nuka on dark clay looks truly yuckie in oxidation, but great in reduction (see teabowl gallery).